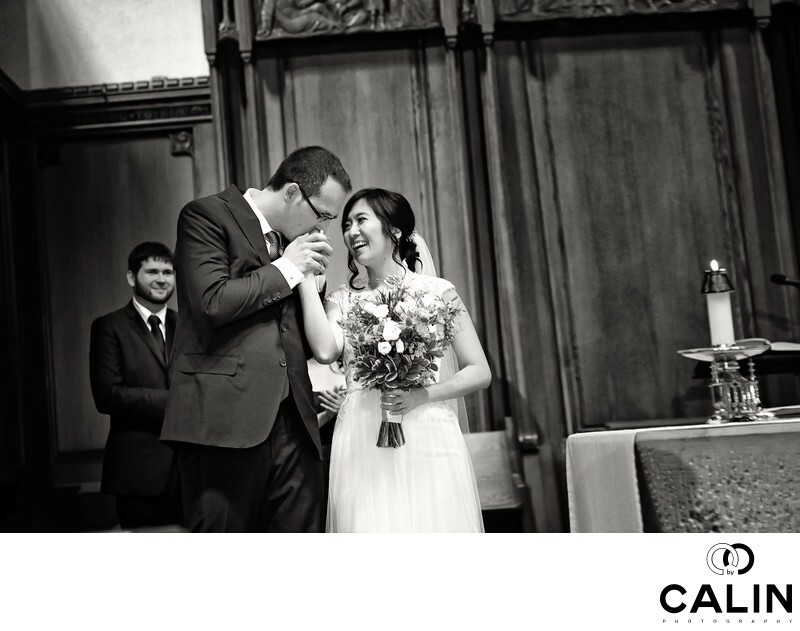 This is a shot taken at St. Michael's Cathedral that the bride and groom will cherish forever! A few minutes after they were married, the bride and groom smiled and looked at each other. It was then when the groom took his wife's hand and gently kissed it. She is laughing genuinely in this image and is enjoying the moment. The best man is also smiling at the happy couple. This richness of emotions makes this an outstanding wedding photo. As a Toronto wedding photographer, I love these moments. They allow me to tell the complete story of the wedding in a photojournalistic essay. Besides the traditional posed wedding day portraits and group photos, we, photographers need a variety of emotions to also provide a multitude of looks to our couples. Candid photographs such as this one cannot be staged, hence they are even more valuable. From a technical perspective this is not a perfect picture, because the best man, in the background is partially hidden by the groom in the foreground. However, the emotions of the three protagonists in this image trumps. The groom is romantic, kissing his wife's hand. She's exuberant and radiates joy in this picture. Finally the best man is smiling and applauding the couple. The composition is central and I used a technique called the Dutch tilt to enhance the photos dynamism. For such photojournalistic moments I always selected a black and white processing to reflect the atmosphere of the picture. Finally, I burned the corners of the picture and dodged the bride and groom to draw the viewer's attention onto them. Location: 65 Bond St, Toronto, ON M5B 1X5.